Tiamat Tuesdays: So You’re Running Tyranny of Dragons . . . Tyranny of Dragons is an immense, sprawling adventure filled with epic encounters, plot twists, and numerous NPCs with their own agendas. 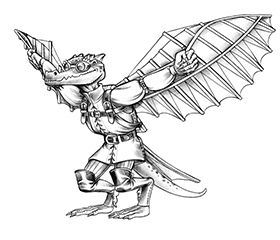 Hoard of the Dragon Queen and The Rise of Tiamat allow (some might say demand) Dungeon Masters to really stretch their wings and put their creativity to the test. Things start out straightforward enough in Hoard of the Dragon Queen, as you’d expect in a low-level adventure, but by halfway through, the Dungeon Master is making almost as many crucial decisions as the players are. The Rise of Tiamat asks a lot from DMs right from the beginning, with its immense background events, political component, and multitude of paths for characters to follow to their goal. It asks a lot of players, too, because they are free to chart their own course through events to a greater extent than in most adventures. Because of that, this week’s column is devoted to offering advice to Dungeon Masters on how to maximize everyone’s enjoyment of these adventures and to keep their game tables humming like well-oiled machines. We begin with a warning to potential players—this article makes direct mention of certain events from the adventure. If you plan to play in a Tyranny of Dragons campaign and you’d rather not have any hints about what terrors await, now would be a good time to flip to a different article (such as The Story So Far… as presented on the Wizards of the Coast site). You need three minds to run Tyranny of Dragons. As always, one of those is the mind of an impartial judge and referee who knows the rules of the game and how best to apply them. One of them is the mind of a dramatist and stage director who constantly guides the game toward maximum tension and excitement. And one is the twisted mind of a high-ranking cultist who believes with all his or her being that the world will be better off under the chaotic evil rule of the queen of dragons. To think like a cultist, you need to understand what motivates them, and their insane goals must guide many of your decisions. So read as much of the adventure beforehand as you can. Understanding the big picture is vital if you’re going to conduct characters through this adventure without losing track of something important. You can start Hoard of the Dragon Queen by reading just the introductory and background material and episode 1. You don’t need to know what comes later to get the ball rolling. But even in episode 1, the introductory and background material are crucial to understanding what’s happening and why. If you grasp what motivates the leaders of the Cult of the Dragon, you can make decisions in their shoes with confidence and react to whatever crazy thing the players do without needing to flip through the book looking for answers that might, or might not, be there. The same thing goes for episodes 2, 3, and 4. You can run each of those almost like standalone adventures—read the episode and dive in. It’s still important to understand the background and introductory material, however, especially in episode 2, so we strongly recommend reviewing that before every session. By the time characters arrive at episode 5 in Hoard of the Dragon Queen, they’re still following where the cult leads, but they’re being led into open-ended situations that can be tackled many different ways. The adventure doesn’t dictate which way is best. In episode 6, for example, some groups might be most successful launching a direct assault, because the characters are equipped for that type of mission and the players love huge, complex battles. For other groups, that episode could become a diplomatic mission, a spy mission, an assassination mission, or a Green Beret-style mission to arm and train the enemy of your enemy. Every one of those is a valid approach, and the decision about how well the characters’ plan works is up to you. We don’t know your players or what they can accomplish—you do. It’s vital that you understand not just what’s going on in the episode currently being played, but how those events will affect what happens in the next episode, and the episode after that. You don’t want to go into episode 7 hamstrung because of something you let the characters get away with in episode 6, or conversely, with the characters utterly defeated because you overlooked the cult’s plan to shift resources to a later fight. In book 2 of the adventure, The Rise of Tiamat, you should be familiar with the whole course of events before diving in. From the very beginning, what the characters accomplish or fail to accomplish can affect the adventure’s outcome in ways that players might not foresee, but you need to understand. We provided plenty of summaries to make the DM’s job easier in this regard, but there’s no substitute for thoroughly internalizing the story. With all that open-endedness, you must be flexible in how you handle events, for two reasons. First, players will surprise you with unexpected plans and spur-of-the-moment inspirations. The lair of the white dragon (episode 2 in The Rise of Tiamat) offers plenty of opportunity. Once inside the lair, one group of characters might hack and slash its way through every creature they meet while another skulks unnoticed through the shadows, a third undertakes to befriend the dragon’s servants, and a fourth boldly—but very unwisely—seeks out a direct confrontation with the dragon. Depending on how you feel about their odds for survival, you might need to change how creatures and NPCs react to the characters’ presence on the fly, to prevent an avoidable TPK. Second, in an adventure this vast , you’re bound to make mistakes and that’s okay. You might forget to implement an important event on schedule, forget to deliver a message from an NPC, forget that the various delegates from the Lords’ Alliance don’t see eye to eye, or misremember the extent of a yuan-ti’s spellcasting ability. Short of utter disaster, most such mistakes can be remedied with a bit of thought. Retroactively backing up and saying, “wait, I forgot that something different should have happened in Waterdeep” is the worst way to fix a mistake. Instead, consider whether the mistake might actually be an opportunity to put your own spin on the story. Tyranny of Dragons is not a rollercoaster ride, so it’s OK if the story occasionally drifts into the weeds. Sometimes, great things can be found in the weeds. You want to end each session of Tyranny of Dragons with a solid idea of where the characters are headed. It doesn’t need to be a cliffhanger, although that’s a perfectly good way to leave things. You need to know at least what the characters intend to tackle next so you can prepare for it. You’ll run a more coherent game that way, and the players will be able to spend their week looking forward to something exciting instead of being unsure where their next steps should take them. Characters and players will reach crossroads in the adventure where they spend time puzzling over what their next step should be—just try to not end sessions on that note, for your own sake if not theirs. The advice on the cover of The Hitchhiker’s Guide to the Galaxy might well have been written for DMs. No matter how much trouble you or the characters get into during Tyranny of Dragons, you have aces up your sleeve that you can call on when you need help sorting things out—the five factions. The heroes aren’t in this alone. They are leaders in the fight, but plenty of other smart, capable people—including some well-known NPCs of Faerûn—are available and ready to do their part. 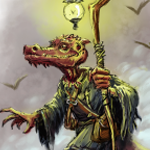 NPCs who aren’t members of the five factions are also available, especially if the characters aided them during their quests: the Arcane Brotherhood, any merchants who traveled with the characters from Baldur’s Gate to Waterdeep, disaffected cultists, angry lizardfolk (if characters play their cards right), and many others. If characters have been acting like heroes, they should have a string of grateful NPCs in their wake across the Sword Coast. Any of those people can reappear with important information, advice, helpful items, or extra swords and shields when the time is right, when the need is great, or when the players are stumped over whether to turn left or right. Much of this is good advice for DMs running any sort of adventure, but when you’re staging situations like those in Tyranny of Dragons, it’s doubly important. Be prepared, be flexible, end sessions with a look ahead, and don’t panic, and you should have an amazing time facing the Tyranny of Dragons. Steve Winter is one of the designers of the Hoard of the Dragon Queen adventure for the new edition of Dungeons & Dragons. This adventure is available in an exclusive autographed collector’s edition with a Queen of Dragons unit patch available only through Kobold Press. And sorry, the remaining copies of the autographed collector’s edition is going to Gen Con with the Kobold crew. The preorders ship tomorrow for all the orders that arrived by August 10. If we have any of the signed edition left after the show, they’ll return to the Kobold Store. I really enjoyed this article! Some great advice in here, especially the mention about ending the session with direction. If the players end with three roads to choose at the end of next session, I have to prepare all three roads, but if they end having chosen the road, I only need to prepare one road. Nice :).